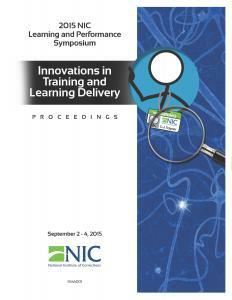 NIC offers a variety of resources and services for those who provide training in a correctional setting. 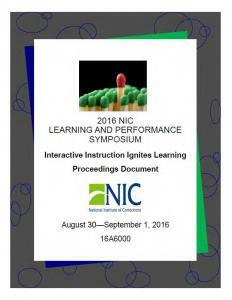 The Learning and Performance Initiative represents NIC’s effort to help build staff training and development capacity in corrections agencies. Below are resources for trainers and curriculum designers. Many materials are online, but most are available through our library only. If you are a correctional trainer and would like additional information about our resources and services, please contact us through our help desk. NIC is committed to improving correctional agencies' internal capacity to enhance workplace learning and staff performance (i.e., training assessment, design, development, implementation, and evaluation). A guide to the resources available to corrections trainers. A guide to instructional models and resources for designing corrections-related training. A guide to effectively facilitating and presenting training and resources for conducting corrections-related training. 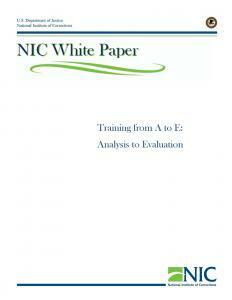 Learn about NIC's technical assistance and Web resources for correctional trainers. Hot Topic: How Can I Design Valid and Reliable Performance Measures and Program Evaluations? Hot Topic: Is your training legally defensible? Anyone involved or interested in the future of learning and performance in corrections should read this publication. “This white paper focuses on learning and performance challenges in the 21st century including the role of technology in learning programs and the incorporation of evidence-based practices into program design and delivery. The paper offers an extensive review of learning research in the areas of theory, learners, learning organizations, instructional design, program design, delivery methods and modalities, learning transfer, and program assessment” (p. 2). 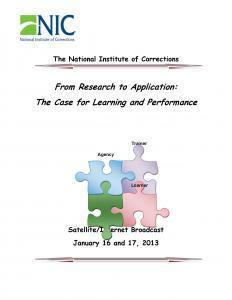 Sections following an abstract include: the background of the National Institute of Corrections NIC) Academy; exploring and addressing challenges facing correctional learning professionals; research and theory—evidence-based practices; learners and learning; learning professionals; learning organizations; instructional design; methods and modality; transfer; assessment; and how to make and promote change. Appendixes cover theoretical models and implications for learning programs; the American Society for Training and Development (ASTD) Competency Model; and terms used (glossary). This user-friendly tool kit is: grounded in research; follows and promotes the use of the ADDIE (Analyze, Design, Develop, Implement, and Evaluate) model and ITIP (Instructional Theory Into Practice) format; and provides “a mechanism for the user to work with curriculum designers to set expectations, then to review, evaluate and give feedback on the curriculum as it is being developed” (p. ii). This publication is divided into six parts: purpose of the tool kit and its components; ADDIE Instructional Design System; ITIP; thirteen tools; frequently asked questions (FAQs); and resources. This blended-learning, self directed course provides the user with the knowledge necessary to create effective training programs. "Along the journey, you will have developed skills to help you assess, design, develop, and evaluate learner-centered instructional designs and curricula targeted to enhance employee job performance." Modules making up this training program are: program overview; learner centered instruction; assessment; performance objectives; ITIP (instructional theory into practice); instructional strategies; evaluation; designing a training design; and closure/certification. In addition to instructional content, these disks have additional resources such as video vignettes, worksheets, and additional reading. Characteristics that result in the best performance of correctional managers and supervisors are identified along with key skills, knowledge, and attributes of effective and successful leaders which are then linked to a set of specific behaviors. This manual includes an executive summary and the following chapters: managerial profiles; ethics and values; interpersonal relationships; oral and written communication; motivating others; developing direct reports; managing conflict; team building; collaboration; problem solving and decision making; strategic thinking; managing change; program planning and performance assessment; and the criminal justice system. A seven-step process for developing and designing a training program according to the ITIP (instructional theory into practice) format is described. Curriculum developers will be taught to create programs that will: teach state-of-the-art information and skills based upon needs assessment analysis; employ learner-centered technologies; help participants succeed with realistic performance objectives; facilitate the transfer of learning to the job setting; promote consistency between training programs; document knowledge and skills taught, teaching methods used, and evaluation of the learning; and promote the inclusion of a lesson plan. And the formal FTO teaching process. Several demonstrations of the FTO format and teaching process are also included. This DVD can be used in conjunction with NIC accession nos. 019008 and 020603. This 3-day broadcast program provides participants with the knowledge and skills to develop a formal on-the-job training (OJT) program for new employees based on a corrections-specific FTO model. It includes using the FTO task-specific format, developing FTO modules, conducting proficiency tests, and implementing a formal FTO teaching process. Each participant will develop an FTO module as part of the training. Several demonstrations of the FTO format and teaching process are provided. This model can be used in a prison, jail, or community corrections facility that provides 24-hour care. Characteristics that result in the best performance of executive and senior level leaders are identified along with the key skills, knowledge, and attributes of effective and successful leaders which are then linked to a set of specific behaviors. Following an executive summary, this manual provides an exploration of: managerial profiles; self awareness; ethics and values; vision and mission; strategic thinking; managing the external environment; power and influence; strategic planning and performance measurement; collaboration; and team building. 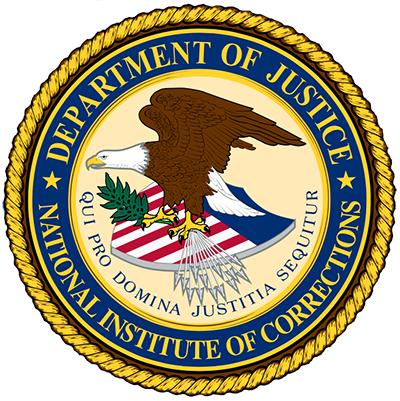 The National Institute of Correction's (NIC's) Service Plan for fiscal year 2009 contains opportunities available to those working in local, state, and federal corrections. Programming, information services, technical assistance, distance learning via satellite/Internet broadcasts, NIC Learning Center, NIC training programs in Aurora (CO), NIC-paid training beyond Aurora (CO), and partnership programs are described. An application for individuals, statement of interest to host partnership programs, an application for regional field coordinator (RFC), and an agency profile are included. Strategies for effective facilitation are provided. The following topics are covered: defining facilitation; basic facilitator competencies; two areas of team focus; facilitator's tip sheet -- starting up and showing attention; facilitator's tip sheet -- asking effective questions; stages of group development and range of facilitator behavior; facilitation -- understanding your "hooks"; facilitation interventions; levels of intervention; intervention guidelines; group intervention techniques; giving feedback; receiving feedback; handling disruptive behaviors; brainstorming; nominal group technique; consensus testing (fist-of-five); plus/deltas; and multi-vote. A self-paced course on how to be an effective mentor is presented. This workbook covers: performance objectives; the differing tasks of a mentor and a supervisor; qualities and experiences (resources) a mentor has; rules of mentoring; effective listening; setting expectations; goal setting; feedback; exploring options and ideas; pitfalls; transitioning; mentor's checklist; action plan; and reviewing the mentor/mentee relationship. Training and practical experience in the techniques and skills of Co-Active coaching as the foundation of a leadership culture are provided during this 36-hour program. Topics covered include: leadership culture; coaching principles; commitment and high performance; Co-Active leadership coaching; listening levels; coaching practice; learning steps; powerful questions; complete requests get action; action and awareness create continuous learning; values; assumptions and interpretations; the "gremlin" concept; talents; a typical six-month coaching engagement; foundation checklist; career discovery questions; designing the coaching relationship questions; and acknowledgement. The development and implementation of an in-house leadership and management development system (within existing agency parameters) are discussed during this 30-hour course. Sections of this manual include: training program introduction; setting a context and identifying trends; trainer and training function self-assessment; strategies for getting management buy-in; establishing a design team and advisory board; identifying candidates for your program; competency development and assessment of managers; leadership development/training deliver options; designing and developing leadership training and development strategies; developing training budgets for leadership ddevelopment using cost benefit analysis; how to evaluate available resources; marketing the leadership development program; and additional resources. This 32-hour program will help participants develop the preparation, presentation, and platform delivery skills needed to conduct training using established curricula. Focus areas include the needs and characteristics of adult learners, learning styles, the role of the correctional trainer, managing a learner-centered training environment, asking and responding to questions, facilitating lesson plans, teaching to performance objectives, and basic teaching methods. Are you interested in getting more bang for your training buck? 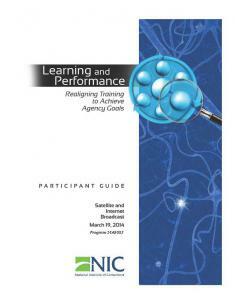 Leveraging the impact of your training department? Being effective with the training you prepare for, design, deliver and transfer into the workplace? Following the science of learning into practice? And you know that "content covered is not content learned?" Then this blended, interactive training broadcast / experience can assist with a transformation of your training department / unit into a center of learning and performance that can directly impact employee on-the-job performance. During this national training program sponsored and broadcast by the National Institute of Corrections on January 16 and 17, 2013, facilitators will: Identify the role of the agency leadership, agency supervisor, trainer and learner in preparation for training and the influence that role has on performance; Explore the research regarding the management of content and its impact on learning and performance; Explore the importance of providing learners the opportunity to practice new skills and knowledge and the effect that has on performance; and Discover the connections between performance expectations, evaluation and transfer of learning and how they affect the learner. Also included are the Facilitator Manual, Participant Guide, and PowerPoint slides from the two-day presentation. And analyze their current system and develop a plan to correct any deficiencies. Pertinent forms and handouts are also provided. "This Training Resource Package recommends several cost-effective methods of providing in-service training for existing staff (p.3)." Sections of this document include: theme--if it meets all the requirements of "Defendable Training," it is training; executive summary; introduction; needs; training delivery options--in-service field training, shift overlap training delivery sessions, experiential training, shift scenario reviews, staff independent studies programs, training presentations during staff meetings, and other in-service training methods (e.g., correspondence courses, ride-alongs, videos, e-learning, satellite downlink, training consortium, and classroom training); and summary. Also included are copies of overheads used. The "concept of 'The Six Moving Parts of Correctional Employee Training,' a model for integrating strategy into the organization's approach to training" is presented (p.1). Sections of this publication are: introduction; overview of the model's components; moving part 1 -- organizational readiness; moving part 2 -- curriculum selection; moving part 3 -- delivery methodology; moving part 4 -- participant engagement; moving part 5 -- workplace reinforcement; moving part 6 -- impact evaluation; summary; and political sidebar -- why correctional training is traditionally under-resourced. The skills that successful correctional training directors need are explained. Modules comprising this training program are: role of the training director; liability issues; policy and procedures; needs assessment annual training plan and evaluation; developing and assessing training curricula and performance objectives; alternative delivery strategies; developing training staff; scheduling, logistics, and marketing. Designed specifically for correctional trainers from all areas of corrections, this twenty-four-hour seminar instructs participants in the development of a strategic action plan that will link training with agency needs. Communication styles, individual and organizational change theory, and social marketing are topics discussed. The manual contains lesson plans and a participant's guide. The seminar was held in Lewisburg, Pennsylvania, September 14-16, 1993. Developed as a demonstration during the "DACUM Facilitator Training" session, April 15-16, 1997 in Longmont, CO., this profile contains in brief form the competencies expected of a training administrator. The need for and process of retraining in an organization are discussed during this 3-hour workshop. Topics covered include: what does retraining look like in your organization? ; benefits of refresher/in-service training; philosophy of adult education and its application to retraining; addressing four basic questions adults bring to training; and development of individual commitment statements.